Imported spec automatic, 20 inch wheels, spoiler, xenon headlights, brown interior, white exterior. Imported spec 2013 Lexus RX 350, 6 cylinders, black SUV/Crossover with grey interior. It comes with 360 degree camera and USB. GCC spec 2016 Lexus RX 350, blue SUV/Crossover with brown interior. It features , 19 inch wheels and. 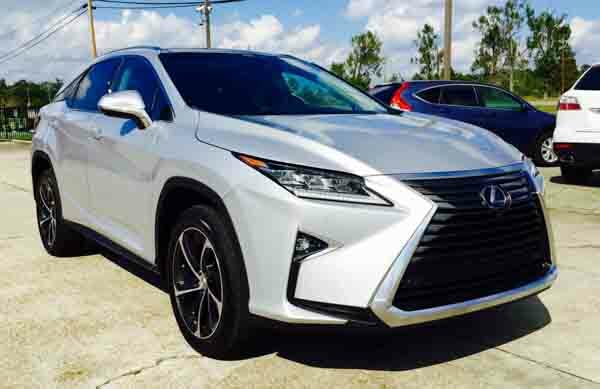 2018 Lexus RX 350 with features such as CD player, parking sensor rear, power windows. It has black interior and is Grey/Silver. Imported spec. GCC spec 2015 Lexus featuring MP3 interface, parking sensor rear, CD player. Black with beige interior. Brown 2013 4 cylinder SUV/Crossover. Beige interior. It has power locks and air conditioning. Imported spec 2015 Lexus RX 350, 6 cylinders, grey/silver SUV/Crossover with black interior. It comes with MP3 interface and power seats with memory. This is a black SUV/Crossover with black inside and massaging seats, sport suspension and 18″ wheels. 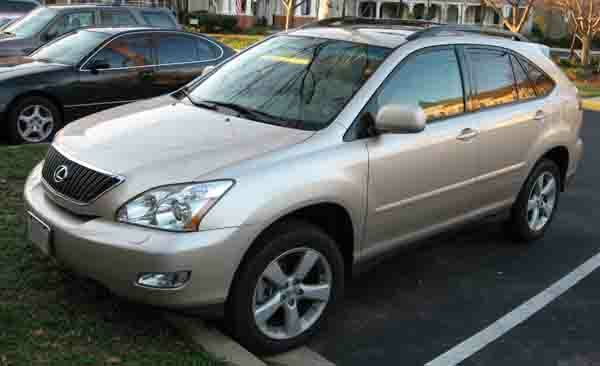 Lexus RX 350 white SUV/Crossover, beige on the inside with bluetooth system and air conditioning. 17″ wheels. Imported spec blue SUV/Crossover, brown interior with power windows, airbags (front and side) and a 6 cylinder engine. GCC spec 2017 Lexus featuring parking sensor front, leather seats, front camera. Grey/Silver with black interior. Tariq - Bought a second hand RX 330 a few months ago as a secondary car, soon enough though it became my first car. It’s reliable, has good options and lots of space inside. Stick to the road though as it’s not good on any other surface. Pros: Spacious and lots of features. Cons: Doesn’t do well off road. Rasheed - I got a pre owned RX 350 for a good price as a gift for my wife, but from the first day, I drove it home I wanted to keep it for myself. The V6 motor has some power, and there are so many fantastic interior features and safety options. Pros: Engine and options for UAE climate. Cons: Handling takes some time to get used to. Mansoor - The RX series has some of the best stylings of any crossover in the market, especially the 2016 model. My RX 350 is a good car, and I would recommend anyone to buy it based on the style alone, it also has awesome features and good power. Pros: Looks, overall build quality and power. Cons: Handling can be a bit of an issue at first. Older version don't have many options but newer models a filled to the brim with amazing features to keep anyone happy. It doesn’t matter how old the vehicle is finding a buyer for it will be easy, and you can still get some decent money back on it. Just have a look at used Lexus RX 350 for sale in Dubai, UAE. They even sell well in the export market. It’s got space inside the cabin, thanks to rear folding seats extra space is available and with the roof rails mounted on top, overflow cargo can go on the roof. As it hails from Japan, you can count on the RX series to be reliable cars. For a heavy vehicle, it’s got quite a bit of power generated from a V6 motor. First appearing in 1999, this luxury convertible poised to take on an expanding market around the world, the crossover market. As the years go by more and more crossovers, join the battle all of which a desperately trying to take down the RX series but to no avail. Sure there are some that sit level pegged, but the RX has been there since day one. Rivals include the Infiniti QX70, Range Rover and the BMW X3. 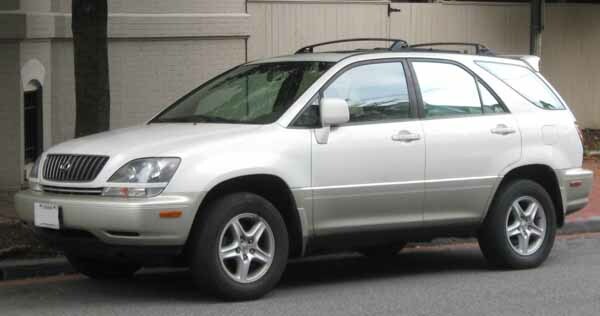 The Lexus RX 300 started it all off, with a bold new shape as if it crash landed in Roswell. As with any Lexus, the RX was fully loaded with a 7-speaker sound system, leather seats, wooden trim, climate control, six-CD changer and 16-inch rims. The centre console could be equipped with an LCD screen to display car information and audio setup. Safety features included daytime running lights, front airbags and five headrests were all standard with Stability Control available as an optional extra. 2000 models were decorated with new lights in at the front, while inside a DVD-based navigation system was offered as an extra. One new coat of paint was added to the list and was made available on for one year. Power is derived from one of three engines; 2.2-litre or 2.4-litre inline four or a 3.0-litre V6 petrol engine. Drive is sent through a 4-speed automatic gearbox coupled to either an FWD or AWD drivetrain. These models were built in 1999, 2000, 2001, 2002 and 2003 and very few of them exist in GCC trim if you want one you’ll have to import it from the United States. In true Lexus fashion, the 300 badge was dropped in favour for 330. The pace age looks returns with some minor tweaks to the interior and exterior. Interior options remained the same throughout the generation with the inclusion of cooled seats, rear entertainment system and navigation coming as standard on higher trim levels. As with any vehicle, there are slight differences depending on which model year you buy. With the introduction of this generation, new headlights were fitted for a fresher look as was a new front grille. The C-Pillar was moved further back leading to a smaller third row window. Over the years, minor changes were made to both the interior and exterior to keep the RX series fresh in consumers’ minds. Three engine options are available: all V6’s they came with a displacement of a 3.0-litre, 3.3-litre or 3.5-litre. Power was either sent to the front wheels or all four wheels via a 5-speed automatic transmission. These models were produced from 2003, 2004, 2005, 2006, 2007 and 2008. GCC models were discontinued in 2007 and replaced with the RX 350. Once again, Lexus drops a moniker in favour of a more focused one. This time with the RX 350 badge attached, the original pace age looks stayed for another generation with minor alterations to the exterior to keep it fresh in the minds of consumers. The majority of standard features were retained, leather seats, power seats, sunroof, roof rails, cruise control, traction control, Bluetooth and 17-inch alloys. Optional extras include reverse camera, Moonroof and a few others. Over the years, the RX crossover over received many refreshes to both the interior and exterior. With minor touch-ups to keep it fresh and in the minds of consumers. Various options were added or removed over the years to apply to customers as were safety options. 2016 models received the most drastic changes to date. Advancing further into the realms of pace age looks, the latest RX models have more polygons than an old school video game. Standard features stray similar to previous generations with the addition of 20-inch rims on each corner. Various new features are joining the optional list such as a panoramic sunroof and a multitude of safety features. Most RX 350 come equipped with a V6 3.5L motor powering all four wheels or the front wheels. Other engine options are on offer as well; 2.7-litre four-cylinder motor and a 3.5-litre V6 hybrid. All engines are mated to either a 6-speed or 8-speed automatic gearbox. These models are available as 2007, 2008, 2009, 2010, 2011, 2012, 2013, 2014, 2015 and 2016. Various trim levels were available during this such as the Platinum. An RX450 model exists as well and are equipped with a hybrid engine and familiar features found in the RX 350.